When you first try to open the games on my site, your browser may display a message about Adobe Flash, asking your permission to run Adobe Flash or the Adobe Flash Player. Your browser may block the games from running unless you answer "Allow". If you see such a message, and want to play the games, select Allow Flash for my website. In Google Chrome or Microsoft Edge, you may not see a message. This is okay. You can still enable the Adobe Flash Player through the Lock icon to the left of the Chrome or Edge browser's address bar. See below for instructions on how to enable the Adobe Flash Player in Google Chrome, Firefox Quantum, and Microsoft Edge. Note: The new HTML5 games do not require the Adobe Flash Player plug-in. The HTML5 games work automatically in modern browsers without it. The image below shows what you may see when you first click the Play links or PLAY GAME button for one of the games on my site in Google Chrome. In the above situation first click the "Click to enable Adobe Flash Player" message, then click the "Allow" button. Doing so will tell your Google Chrome browser that you want the games on my site to run so you can play them. If You Don't See the Message. You can enable or disable the Adobe Flash Player anytime through the Lock icon at the top of the Google Chrome browser. 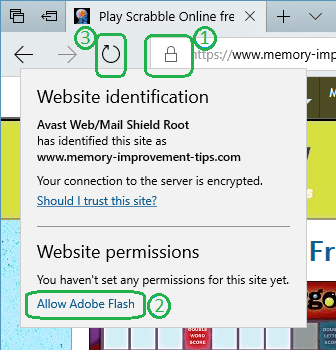 So if you don't see the Allow message, try enabling Flash manually through the Lock icon, as shown in the following image. 1. Click the Lock icon to the left of the address bar. This opens the "Secure connection" menu. 2. Click the "Site settings" link at the bottom of that menu. This opens Chrome's Settings screen (not shown here). 3. On the Settings screen, go to the Flash section and change "Ask" to "Allow". 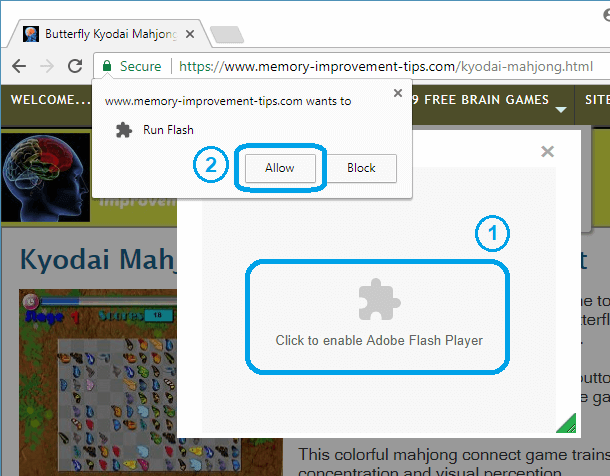 This activates the Adobe Flash Player on my website, Memory-Improvement-Tips.com. 4. Return to my site and click the page Reload button (the curved arrow button to the left of the Lock icon). This refreshes the page. After following the steps above, the Adobe Flash Player should be working on my website in your Google Chrome browser. The Flash-based brain games should open for you now. The following image shows what you may see in Firefox Quantum when you first click the "Play" links or PLAY GAME button. Here you would first click the "Activate Adobe Flash" link, then click the "Allow and Remember" button. This will tell your Quantum browser that you want to run the games so you can play them. It also tells Quantum you want it to remember that setting and automatically allow Adobe Flash the next time you visit my website. Or, if you wish, you could click Allow Now instead. The games will then work only temporarily, as long as you keep the browser tab open. If you choose that option, you'll need to select Allow and Remember or re-select Allow Now the next time you visit my site if you want to play the games again. If You Don't See the Message. Hopefully you will see the Activate Adobe Flash message in Firefox Quantum. 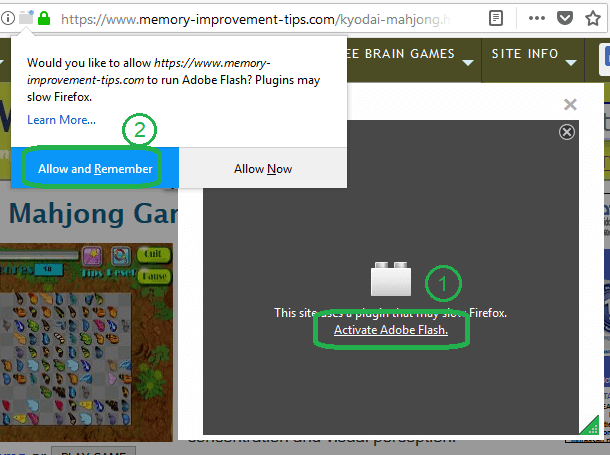 Because as of Firefox version 55, all Flash content is set automatically to "click-to-play." 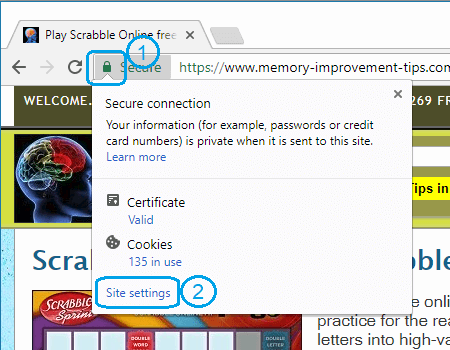 At this time, there does not appear to be a separate option in Quantum for activating Flash through the Lock icon, as in Google Chrome and Microsoft Edge. In the most recent version of Microsoft Edge, clicking the Allow Flash button on the game pop-up window may not work. In that case, follow these steps. The image shows the steps also. 1. Click the Lock icon to the left of the address bar. This opens a "Website identification" menu. 2. Click the "Allow Adobe Flash" link at the bottom of that menu. 3. Click the Refresh button to the left of the Lock icon. Then click the Small, Medium, or Large link under the picture of the game. 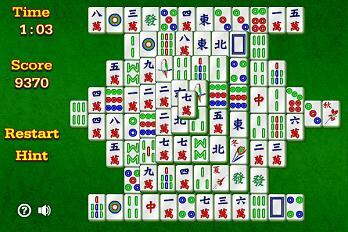 With any luck, the game will open successfully in the pop-up window. These steps worked in my version of Microsoft Edge. If after going through the advice above to enable the Adobe Flash Player you still can't get the games to run in your browser, feel free to send a message to me through my Contact Me page. I may be able to help troubleshoot.